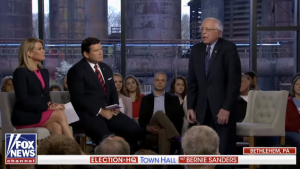 RUSH: The Bernie Sanders town hall on Fox News has got people on both sides of the political divide agitated. The Fox News fans are livid that Bernie Sanders was given the forum and access to that audience, a larger audience than Bernie can find on any other cable news network out there, which is true. In fact, Bernie created the highest rated town hall yet on any network. It was by no means a record audience, but for town halls it was: 2.6 million people, 50,000 people in the demo 25-54. ... they are livid at Bernie because they think Bernie is single-handedly destroying their effort to destroy Fox by mainstreaming it, by giving it credibility, and they are deathly afraid that Bernie Sanders — and Pete Buttigieg is next, that these liberal Democrats doing town halls is going to further mainstream Fox, which is going to make it more amenable to additional advertisers, which will then further undercut the left’s boycott effort. As angry as you may be at Fox, trust me, they are livid at Bernie Sanders for this. They are single-handedly running these boycott campaigns. They happen every day. They’re so mainstream media now that they don’t even make the news. But they’re running these advertiser boycott campaigns, and Bernie’s undercutting ’em. Dan Pfeiffer who was a famous Democrat spokesman, Clintons, Obama, “Fox News will use these Democrat town halls to attract new advertisers, which will help keep Hannity and Tucker on the air, undoing a lot of grassroots pressure on advertisers.” The DailyKoS. “Yeah, this is a great thing for Sanders personally. But he’s undermining everybody’s efforts to destroy Fox’s ability to sell advertising.” And they’re really mad that Sanders set the record. They’re mad that more people watched Sanders on Fox than have ever watched a Democrat town hall on CNN or MSNBC. They can’t believe it! They’re livid! Bernie is a sellout, he’s selfish. And they’re trying to whip up a bunch of anti-Bernie Sanders pressure. Sometimes you write about the most obvious thing in the world because it is the most important thing. Reaction to the outcome of Robert Mueller’s investigation shows Americans again how divided we are. If you are more or less of the left, you experienced the probe as a search for truth that would restore the previous world of politics. Instead the traitor got away with it and you feel destabilized, deflated. If you are of the Trumpian right, it was from the beginning an attempted coup, the establishment using everything it had to remove a force it could not defeat at the polls. You are energized, elated. Now both sides will settle down, with the left as forthcoming in its defeat as the right is forbearing in its victory. I just wanted to show you my fantasy life. The Trump forces will strike with a great pent-up anger, and the left will never let go. Both sides will be intensely human. And inhuman. Because the past few years the character of our political divisions has changed, and this must be noted again. People are proud of their bitterness now. Old America used to accept our splits as part of the price of being us—numerous, varied, ornery. Current America, with its moderating institutions (churches) going down and its dividing institutions (the internet) rising, sees our polarization not as something to be healed but a reason for being, something to get up for. There’s a finality to it, a war-to-the-death quality. It is, actually, shocking, and I say this as a person always generally unshocked by American political division, because I came of age in it. I was in college, and it struck me hard. It was called “The Two Americas,” and was elegantly written and prescient. The candidates were so unlike each other that they seemed to represent different “instincts” about America. “They suggested almost two different countries, two different cultures, two different Americas,” Mr. Morrow wrote. “The McGovern campaign marches to the rhythms of the long, Wagnerian ’60s”—racial upheaval, the war, feminism, the sexual revolution. McGovernites had a more romantic conception of what leadership could be, should be. In Nixon’s America, on the other hand, there was “the sense of ‘system.’ The free enterprise system, the law and order system, even the ‘family unit’ system.” They were protective of it, grateful to it. And the antonym to their idea of system wasn’t utopia, it was chaos. “They are apprehensive of the disorders that the late ’60s adumbrated to them, the turmoils that they suspect a McGovern accession might bring.” They wanted evolution, not revolution. The Message of Democrat Women Dressed in White at SOTU?